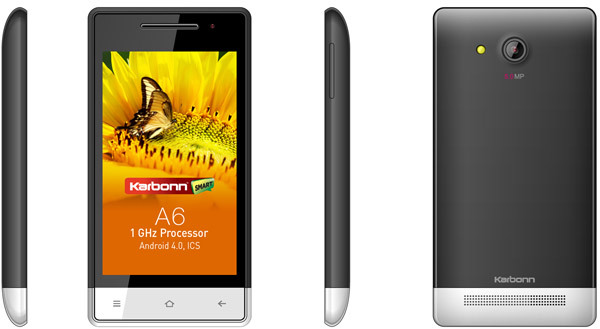 Coming in white and black, the Karbonn A6 is a great smartphone that was released in March 2013. The device uses Android’s Ice Cream Sandwich operating system and comes with many amazing features that turn it into a remarkable phone. Our article today will show you how to get rid of all software problems on your Karbonn A6 by doing a hard reset. This operation is also popular under the name master reset and can be performed by following a few simple steps. It is a great way to rapidly get rid of viruses and solve more software issues without having to waste too much time and money. Instead of going to a service to get your phone fixed, try sorting it out by doing a factory restore at home. In case this didn’t work, you can then go to a specialist and see what’s wrong with your device. Before we dive deeper into the details of the procedure, you should know that the Kabonn A6 comes with 512 MB RAM and a card slot for microSDs that could store up to 32 GB. When it comes to connectivity, you can use GPRS, Bluetooth, USB and the Wi-Fi 802 hotspot. There are two camera on the phone – one on the back and one in the front. The first one is characterized by the following features: 5 MP, LED flash and video capabilities while the secondary one is only good for taking photos. Coming with a removable Li-Ion 1450 mAh battery, the phone lasts in stand-by mode for a maximum of 250 hours. You can also continuously talk for close to 4 hours without having to worry about recharging the Karbonn device. It also comes with FM radio and supports most music file types from MP3s to MP4s, as well as WAV, WMA, AAC, etc. You might have noticed this with similar Karbonn models, but in the case of the A6 you can easily do a hard reset using the menu option. This requires your phone to give you access to the menu and settings while you’ll also need to be able to use the keyboard. In case the device often crashes or shuts off by itself, this might not be the best method to use. Open the Apps Drawer and go to Settings. 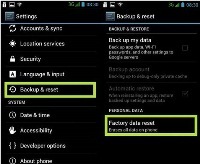 Choose Backup & Reset, and then tap Factory Data Reset. Read the information and select Reset Phone. If prompted, tap Erase Everything and you’re done. The device will then begin the reboot and show you exactly what it’s doing. You will be able to see when it’s erasing files, when it starts to restore settings to factory and other similar parts of the procedure. Once this is done, you will be able to see that, and the phone will restart before you can use it. Make sure you create a backup in advance so that you don’t lose important music, pictures and other user data. You can use the SD card for that, as well as other external devices. Press and hold the Volume Up and Power keys and wait for the Recovery Menu. When this pops up, release both buttons, and then wait for it to fully load. Choose Factory Reset using volume down and press Power. Highlight Yes and confirm it using the same Power key. Read the warning and press Reboot System Now to begin.